Man, don't you just love technology? 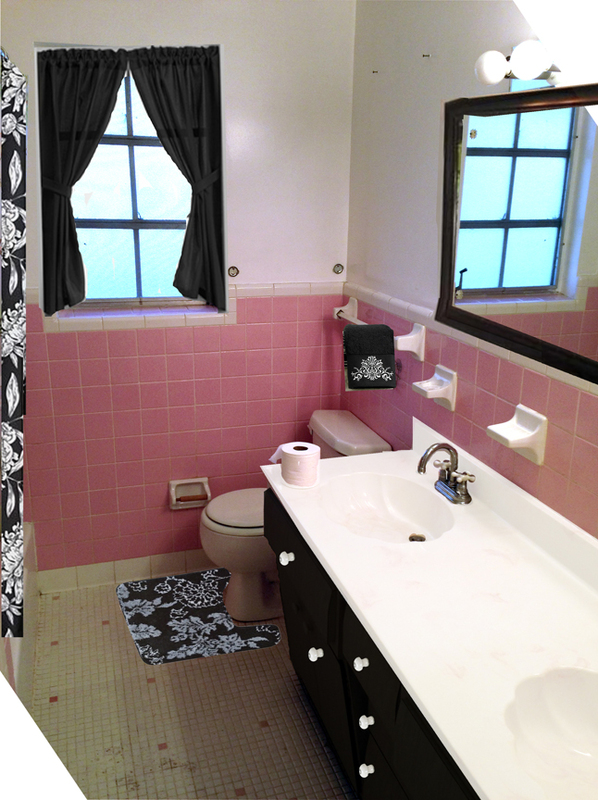 lol I couldn't decide if it would be too much if I painted the vanity cabinet black or if I should make it white. After this little experiement, I commited fully to the black - I love it! I also toyed with the idea of painting the walls a light gray, but I think I prefer the white. 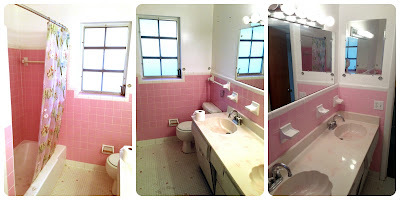 I am definitely going to frame the mirror and paint that awful cream and pink swirled fake marble vanity top white. I don't even care if I have to paint it once a year, I HATE that nasty marble and it doesn't match anything else int he room. So, this weekend I decided to start working on this project :) The closet was going to be the biggest part of it, so I started there. The door is a paneled bifold door that is actually too short for the opening - basically it will never stay in the track and it is incredibly annoying. I saw a tutorial on pinterest on how to turn bifods into French doors, and while I would have to do it a different way than they said, I have figured out how to make it work for me and I hope to do that as well :) Also, I will paint th edoors black. The inside of the cabinet was a strange cluster of issues. It has nasty wire shelves (I hate these on principal, but these were obviously old - they were disgustingly sticky and I had to wash my hands multiple times to clean the gunk off me). The real mystery of the wire shelves came when I noticed that they had little wood supports under them - just like you would put to hold up a decentn wood shelf. Why on earth would you take out wood and replace it with these? These people had some weird thought processes, I tell ya. The biggest problem with this closet is without a doubt the floor. The previous owners ripped up ALL of the tile to put in this "laundry chute" if you can call it that. It's more like just a square hole in the floor right now and it looks like it was made using air conditioning ducts. Yeah, classy. Not only does it look awful, but my dog is way to curious about it any time we open the closet door, plus can you imagine how annoying it would be if you dropped something and it rolled into the hole? So, I will be filling the area outside the hole with cement, painting it, and then getting a nice looking hamper and cutting the bottom out before mounting it to the floor. It's a simple idea, but it will definitely take the most time and know-how. Anyway, so on Monday I started gutting the closet and taking all the other stuff off the walls so I could patch the zillion anchor holes in there. ALl of those screws from the shelves had anchors holding them up, so I had to remove them as well. Some of those holes were huge! I hope spackle is enough to fix them. It didn't stop with the closet though. I have already purchased a new mirror to go here, so I took the old plain one down. I saw a few old anchors around this mirror before, but it was worse once I removed it. The mirror was concealing more old anchors! Also, there were anchors for small towel bars (they were up in the room, but they were sitting in the closet - never to be put up again). So, guess how many anchors I pulled out of the walls in here? 42! That is crazy! After removing the anchors, I noticed a weird depression in the wall by the closet door. It looks like someone punched a hole in it and then didn't bother to level the piece they put in to repair it, so it's a big depression there. Also, the weird sunken in spot was peeling so my husband decided to pull the paint off ... and the paint just kept coming! The closet had never been painted, but the rest of the room has semi-gloss paint all over it... and it turns out the people never primed the plaster before they painted it. Combine that with the fact that this bathroom has no ventilation for the steam and BINGO you have peeling paint. In light of our paint problems, I we decided to go to Sherwin Williams and find out what we need to do. Guess what? We have to scrape ALL the paint off the entire room. Yeah. Then we have to use some type of special sealing primer - apparently it's more like a glue - to basically create a new surface for the new paint so that the peeling doesn't happen again. So, now my nice bathroom I have planned will take a ton more work and time than it should have. Just like everything else in this house. So, I have already purchased my shower curtain, bath mats, fancy mirror, and shower head for in here ... and they will just have to hang out while I get this mountain of work done. So sad. I will also be scraping out all of the old caulk and redoing it. They even caulked around the floor in here! Sigh. Sorry if I sound complainy, and sorry for such a long post. I know it will be worth it in the end.